A very special sweater, made of 100% organic merino wool and soft purl stitches. The fluffy knitted melange jumper from Disana's Nature World collection is one-of-a-kind in any wardrobe. The fine organic merino wool and the soft purl stitches give the sweater a pleasant, gentle feeling on the skin. 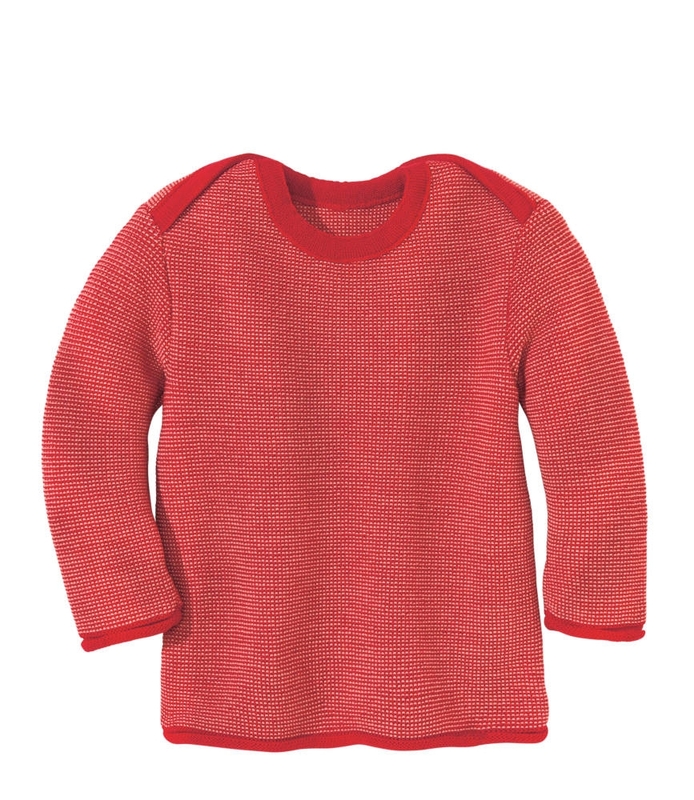 If your child wants to run out and start into the day, the pullover is quickly pulled over thanks to its clever envelope neckline. The design is on the one hand classic and simple by the plain color. In combination with the color-stepped rolled cuffs and the melange look, the pullover also gets a modern trend look. Get out into the forest and into the meadow to play, run, run around, be a kid. In the color world of "Nature World", Disana has recorded the colors that are particularly suited to play and fun outdoors in nature. Diana children's fashion is made for life with nature and supports the urge to move our children with its child-friendly cuts. Wool badly accepts dirt, is sweat-resistant and antistatic. Through its "recovery capacity" wool hardly creases, as the fibre is very elastic. Wool articles are virtually non- iron. Wool is very colour-resistant and hardly inflammable. It doesn’t burn but carbonizes only. Wool also accepts few smells (e.g., from sweat) in contrast to art fibres, and has a natural self-cleansing function. Taken up smells are secreted to the air and the wool smells neutrally and freshly again after a short time in the fresh air. Wool can chemically bind sweat and urine and therefore neutralize them for a long time. If, however, woolen articles are to be washed, natural wool is basically hand wash at max. 30 degrees. Wool is very sensitive to alkalis and therefore also to soap. For washing the woo, disana recommends their disana wool shampoo. To ensure that it does not melt, wool must not be soaked, rubbed, or brushed. Just push it with your hand. Drying in the sun, on the heater or even in the tumble dryer are taboo.